LET Finale with a double Spanish Victory. 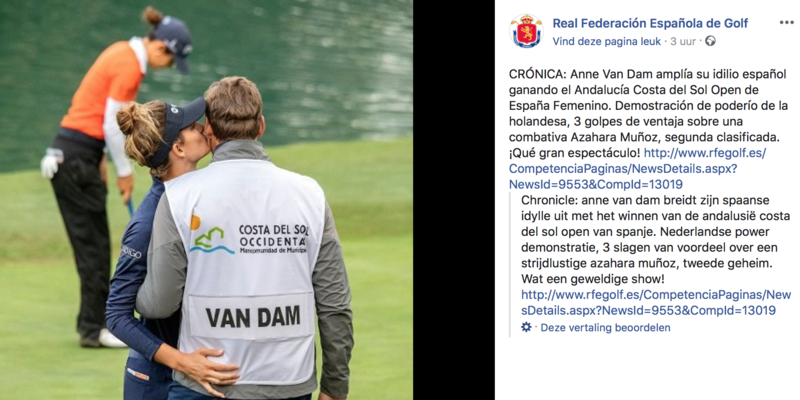 Anne Van Dam from the Netherlands successfully wrapped up 2018 on the Ladies European Tour by claiming her second victory on Spanish soil this season at the Andalucía Costa del Sol Open de España Femenino. The powerful hitter, who won the Estrella Damm Mediterranean Ladies Open in Sitges two months ago, fired rounds of 68, 67, 66 and 70 for a total of 13-under-par at La Quinta Golf Resort in Benahavís, Marbella. The 23-year-old from Arnhem had been in possession of a three-stroke lead when darkness forced play to be suspended overnight. She powered into a four-stroke lead following the completion of the third round on Sunday morning, carding three birdies in her last five holes, but then, in the final round, the 2016 and 2017 champion, Azahara Muñoz, did her best to catch her. Muñoz gave Van Dam a scare when she closed the gap to two strokes courtesy of four birdies in six holes on the back nine, but a double bogey at the short 16th, where she lost her ball down a rocky slope beyond the green, halted her challenge. She took second place at 10-under-par after a final round 69. It was another brilliant performance from Van Dam, who finished second on the Order of Merit and collected a first prize of 45,000 euros. After a pair of birdies on the fourth and sixth holes, she was six strokes clear at the turn. A run of seven pars on the back nine, followed by just one three-putt bogey on the 17th and a regulation par on the short par-4 18th proved more than enough to earn her third Ladies European Tour title.